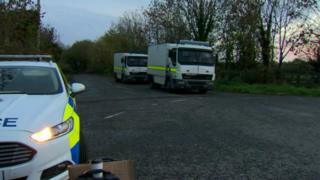 Three "viable explosive devices" have been found in the Dunsilly Road area of Antrim, police said. The PSNI received a report of a suspicious object at about 12:30 GMT on Sunday. Army technical officers dealt with the devices. No homes were evacuated during the alert but the A26 road between the Dunsilly Roundabout and the Kilbegs Road Roundabout was closed for a time. The road reopened at about 17:00 but the security alert did not end until about 20:00. DUP councillor Jordan Greer said those who abandoned the devices offered nothing positive to society and praised police officers and the Army for removing the devices.